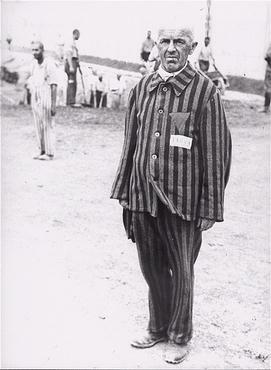 A prisoner in Dachau is forced to stand without moving for endless hours as a punishment. He is wearing a triangle patch identification on his chest. 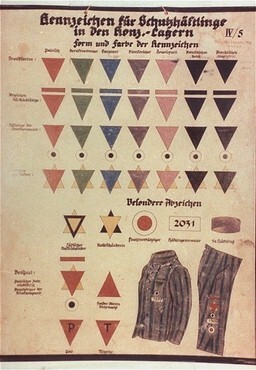 Below: A chart of prisoner triangle identification markings used in Nazi concentration camps which allowed the guards to easily see which type of prisoner any individual was. The horizontal categories list markings for the following types of prisoners: (from left to right) political, professional criminal, emigrant, Jehovah's Witnesses, homosexual, Germans shy of work, and other nationalities shy of work. The vertical categories begin with the basic colors, and then show those for repeat offenders, prisoners in punishment kommandos, Jews, Jews who have violated racial laws by having sexual relations with Aryans, and Aryans who violated racial laws by having sexual relations with Jews. The remaining symbols give examples of marking patterns.